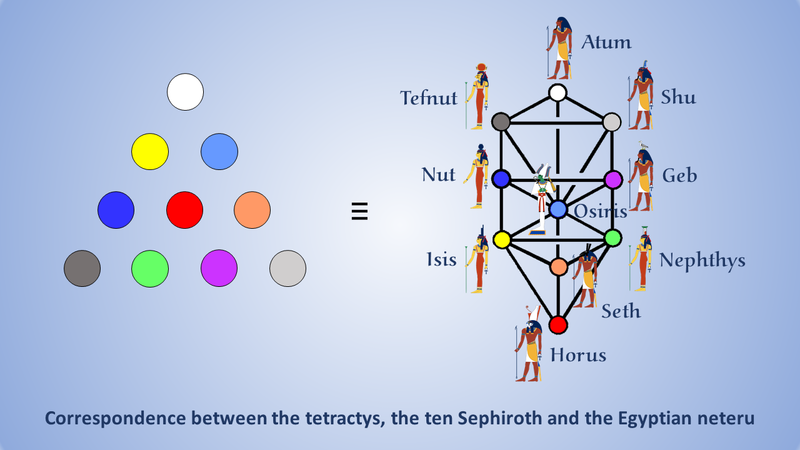 correspond to the two triangles of white or black hexagonal yods forming a Star of David and Malkuth at the base of the Tree of Life corresponds to the ⊕ yod at the centre of the tetractys. As the counterpart of the seven Sephiroth of Construction, the seven hexagonal yods symbolize degrees of freedom in holistic systems. They manifest as the seven notes above the tonic, or fundamental, in one octave of the Pythagorean musical scale, the seven higher dimensions of space predicted by what physicists call 'M-theory' and in many other systems, such as what mathematicians call the 'fourth division algebra,' which makes use of seven unit imaginary numbers as components of 8-dimensional numbers called "octonions." This fundamental equivalence is a major key to unlocking scientific information about the nature of the physical universe that is encoded in sacred geometries. In fact, it is the "Rosetta Stone" that enables correlation between the Tree of Life and other sacred geometries. Information that they encode in analogous ways can then be recognised as such and scientifically interpreted. The presence of common parameters in sacred geometries that are also predicted by a theory is evidence that it is true when they occur too frequently to be due to chance and when they are related in exactly the way that the theory requires. This correspondence between three ancient spiritual traditions should serve to emphasize to the reader that the yods of the tetractys are far more than mere dots or mathematical points symbolising the number 1. They are only such to the modern secular mind that cannot see beyond the exoteric meanings of words and symbols. Yods signify not only the number 1 but the spiritual essence of each Sephirah as a degree of freedom intrinsic to the ten-fold nature of God. They are not mere mathematical points. They have a spiritual aspect that reveals itself in sacred geometries built from the tetractys.